Solar energy resource assessment projects are critical to the successful siting of solar thermal power plants. Before a plant is developed, the environment of the plant’s intended location must be studied in detail to ensure that the site will continue to deliver a consistent and reliable source of solar power. If it is determined that a site cannot harness a continuous and sufficient solar-energy supply, another site must be selected and researched. Solar energy resource assessment projects were conducted in many different territories by Solar Millennium AG, a global project developer for solar thermal power plants. The developer’s task entailed gathering radiation and climatological data to assess the suitability of particular locations. Their assessment task was complicated because the sites that Solar Millennium had to research and test were often in remote and inaccessible desert locations. Any equipment used to gather the data had to be rugged enough to withstand the harsh, remote environments. In addition, because it was impractical and hazardous to retrieve the data manually from these locations, the equipment needed to have low-maintenance requirements, and the data needed to be remotely retrievable through a reliable and secure connection. One location that Solar Millennium researched was in the Atacama Desert in Chile. For this solar energy resource assessment project, a variety of sensors were used: pyranometers, anemometers, wind direction vanes, temperature sensors with radiation shields, and tipping bucket rain gages. To supply the necessary wireless communication solution, Solar Millennium contracted with Wireless Innovation. Wireless Innovation is a global provider of satellite solutions to the telemetry marketplace, has worked extensively in the renewables market, and has experience providing communication solutions that integrate with Campbell Scientific dataloggers and LoggerNet software. 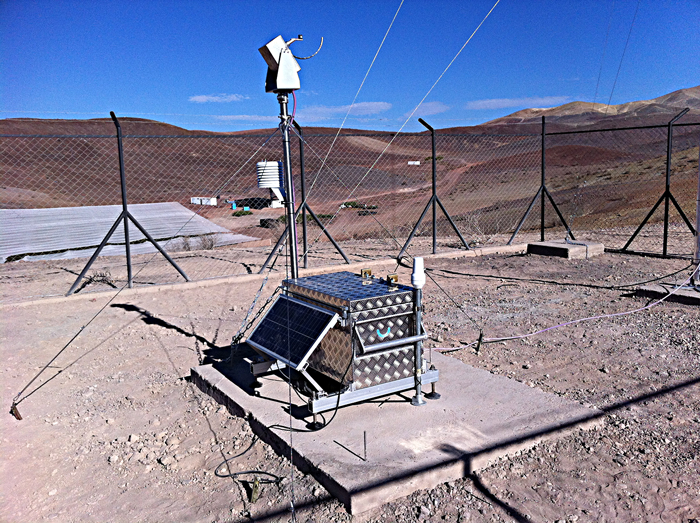 For the Atacama Desert project, Wireless Innovation designed and employed a communication solution that operated via the Iridium Low Earth Orbit (LEO) satellite network and a MiChroSat 2403 satellite modem. The Iridium satellite network provides complete coverage of the earth, enabling communication services to and from remote areas where other forms of reliable communication are not available or feasible. The MiChroSat 2403 modem allows datalogging solutions to be deployed securely and reliably in remote and hostile locations where GPRS (general packet radio service) coverage is poor. For their satellite data solution, Wireless Innovation integrated a number of Campbell Scientific CR1000 dataloggers into the Iridium network. The CR1000 dataloggers were rugged enough to withstand the harsh, remote environment of the Atacama Desert, offered low-maintenance requirements, and integrated seamlessly with the satellite solution. Data retrieval via email was aided by the use of Campbell’s LoggerNet software. Consequently, Solar Millennium was supplied with the detailed radiation and climatological measurement data they needed for their site suitability assessments.